One of the NASA team’s favorite haunts on Tanegashima was the Steppin’ Lion. It was one of the only restaurants on the island that made burgers, so we’d all head over when we were missing American food. 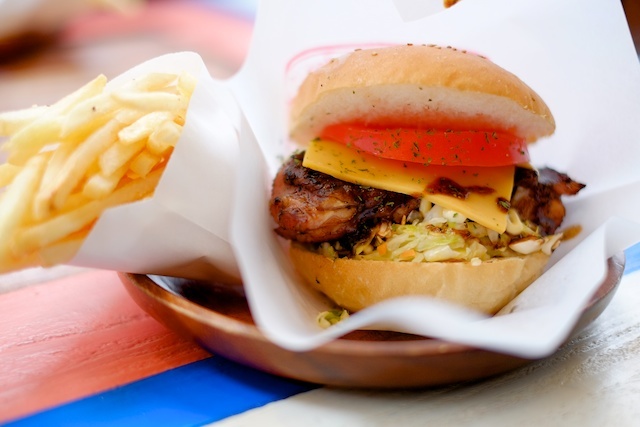 The burgers are great, but even better is the jerk chicken, which also comes in burger form. I was googling around for info about Tanegashima and found a few videos from French surfing magazine, Oui Surf. I was sort of tickled to see they’d made a video of the Steppin’ Lion. They captured it well, in my opinion. Japon / Nourriture / Steppin Lion from ouisurf.ca on Vimeo. And one about a Tanegashima specialty: chicken sashimi. Yes, I tried it. And no, it ain’t for me. Japon / Nourriture / Tori Sashimi from ouisurf.ca on Vimeo. Bodacious burgers and scruffy surfers that speak French. You are welcome. chicken sashimi? how is that possible? ?